MummyPages.ie, Ireland’s largest community of mums investigates the rise in expenditure by families in preparing for their child’s First Holy Communion. Now in its second year, MummyPages research on ‘First Holy Communions in Ireland’ covers all aspects from the costs to the celebrations and the gifting of money. This year the MummyPages mums continue to feel that the First Holy Communion celebrations can be a bit excessive with 87% of mums, consistent with almost the same number last year at 88%. The online mum community says that the parties, gifts and fuss surrounding the communion day attire, often drowns out the meaning of the special sacrament that the child is to receive. Another issue concerning many of the MummyPages mums (71%) is children’s new found focus on the amount of Communion money they will receive which according to six in ten mums (59%) earns children bragging rights on the school playground. The average amount of money children were gifted last year on their First Holy Communion was €323 up from €299 in 2014. However, the biggest jump is at the upper end of the scale where 56% of children received sums in the region of €500-1,500 compared to 31% in 2015, and of these one fifth received over €1,000. 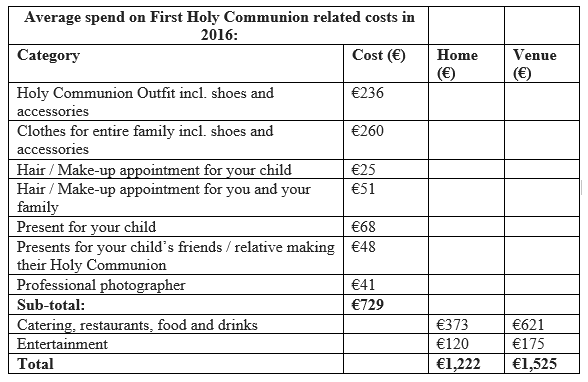 Over half (57%) of parents report feeling the strain when it comes to paying for their child’s First Holy Communion with the average family spending between €1,222 – €1,525 depending on whether they host a party in a venue or at home. Holy Communion Dress/Suit: Most or 63% of MummyPages mums spend up to €200 on their child’s Holy Communion outfit including shoes and accessories, 35% of mums spend between €201 and €500, while 2% of mums spend up to €750. Four in ten (42%) mums opt for specialist boutiques for their child’s communion outfit up 10% from the previous year, followed by 17% who purchase from a department store, while 9% of mums choosing to borrow a pre-loved outfit from a friend or extended family member. Interestingly, mums are calling for primary schools to implement cost saving initiatives to help parents cope with the Holy Communion costs with 70% of mums agreeing that children should instead wear their school uniform on their special day. Hair & Beauty appointments: 59% of mums use the Holy Communion Day celebration to get their little girl’s ears pierced. 33% of MummyPages mums will style their own child’s hair for their big day, while 58% of mums will spend up to €50 on a professional hair appointment. Clothes for the family: The overall spend on clothes for the entire family increased this year with 13% of mums spending up to €100, 63% of mums will spend between €101-250, 20% will spend anywhere in the region of €251-500 and 2% of mums will spend up to a whopping €1,000 on new clothes including shoes and accessories for the entire family. Celebrations: Over half (52%) of mums will host a party at home with family and friends with entertainment, food and drinks. 39% will book a venue that provides dinner and entertainment for family and friends. 20% of families will go to a restaurant and then visit a local park or family attraction such as the Zoo. Holy Communion money: Children remained the biggest winners in 2015 with the average amount of money recieved last year a huge €323 up from €299 in 2015. However, the biggest jump is at the upper end of the scale where 56% of children received sums in the region of €500-1,500 compared to 31% in 2015. Mums are using this opportunity to introduce their children to saving with 87% of mums stating that their child will save most of their Communion money. The top choice for 59% of our young savers seems to be the Credit Union, 26% will use their local post office and 9% will put their saving in a bank. Professional photographer: One in ten mums (11%) will spend up to €50 on the school communion photos provided by the school, while 27% of mums plan to spend up to €250 for professional photos. Most mums (62%) mums don’t feel the need to stump up for a professional photographer, and are happy to capture their child’s special day using a smartphone or digital device.